Amazing support from throughout Russia and support from foreigners earned Otkritie Arena the well-deserved third place. Congratulations! This year’s edition of Stadium of the Year had a record turnout of 96,772 people casting their votes. 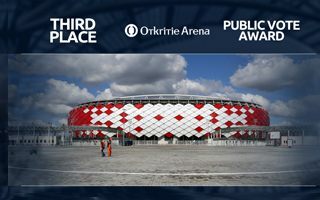 Nearly one in four voters named Otkritie Arena in their top five. A total of 22,872 votes were given to Moscow’s latest stadium and long-awaited home for Spartak. As Spartak is considered to be Russia’s most popular club despite lack of recent success, we’ve seen votes for this stadium coming from across the world’s largest country. But it wasn’t only Russia and the third place couldn’t have been reached if not for votes from other nations. With the total of 89,518 points the stadium gathered more support than any previous winner, but in this year’s edition this was enough only to get onto the podium. How did the Jury view Otkritie Arena? The Moscow World Cup venue was considered an attractive addition to Russia’s sports infrastructure, but it was also an expensive stadium, which made an impact on the final Jury Vote position. By far the best feature of the stadium is its façade, catching the eye instantly with interesting use of Spartak’s club crest. “The red and white scales on the façade are well executed and is the redeeming feature of this design. The roof structure is in my opinion a clumsy solution and consumes a great deal of steel for little aesthetic payback.” says Mike Bell of South Africa.